It’s already Wednesday after the long weekend. How did that happen?? At least that means another weekend is just around the corner, right? So what did we do on this trip? As you know, I’m much more of a get-out-and-see-everything kind of guy on vacation, but this trip wasn’t about that. It was about relaxing and spending time with friends and I’d say we did exactly that. We had a planning meeting the week before we left to figure out who would be bringing what in terms of supplies and who would cook which meals. After doing a similar trip last year and ending up with WAY too much food, we thought this would be a better approach. It definitely was! That’s a great travel trip for planning a group trip to common living quarters – plan food and drink out! We knew who was cooking what and who was bringing what, so there was never a question of what we were going to eat. And we didn’t end up with a ton of leftover food this time. Okay, we did more than eating and drinking on this trip. But not too much more. 🙂 After arriving around 5p on Thursday, we hung around the house and outside chatting, eating, drinking, playing games, and building a camp fire (that part was outside, of course). 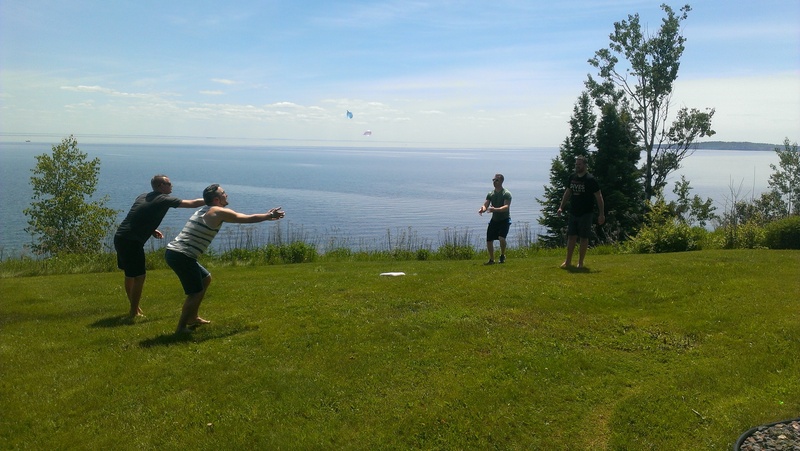 We hung out for most of Friday as well, though we may have ventured outside for some water balloon fun. 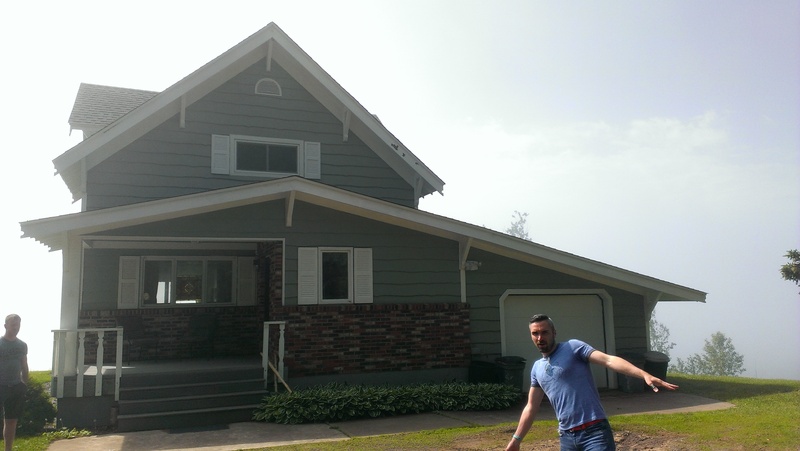 We had already planned to head into Duluth that evening to have dinner and enjoy the fireworks display, so we did that around 630p. We had a good time there! We had dinner at Tycoons, which was a good choice. Very casual, not crowded (even though it was a holiday, or maybe because of that), and good food. After that, we wandered down to the Portland Malt Shoppe for an ice cream treat (I had Snickers ice cream in a sugar cone – tasty!) and then walked the very short distance to the lake, which is where we stayed until after the fireworks show. We were all pretty pooped after that, so once we got back to the house (about 35 minutes away), we all crashed. Part of Saturday was spent hanging out around the house (shocking, I know), but our friend Nick (aka Nickles) really wanted to go swimming. 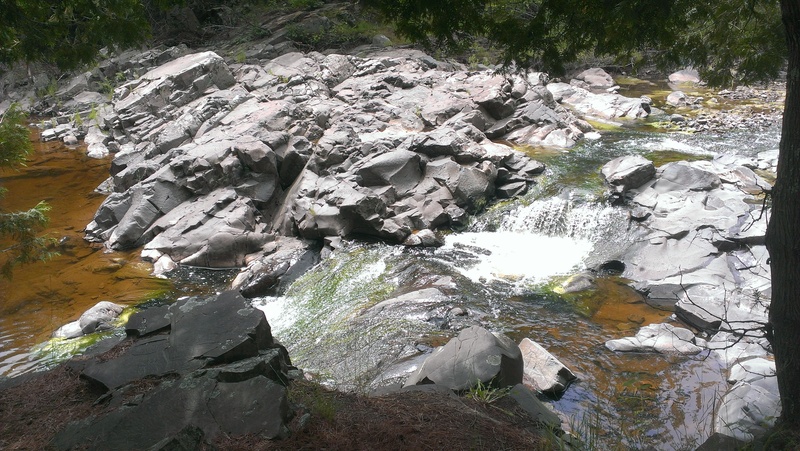 We hemmed and hawed about it for awhile, trying to figure out the best place to go, and we eventually settled on a couple of swimming holes in the Lester Park neighborhood in Duluth. The water was cold, but everyone had fun! 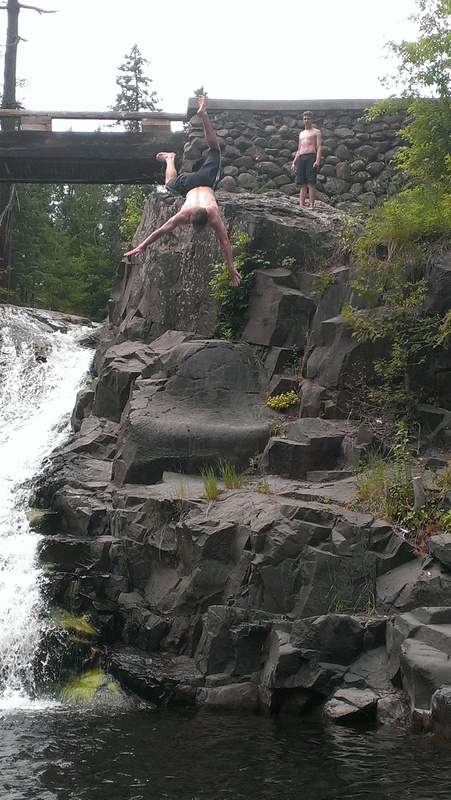 There was some crazy jumping/diving happening at both swimming holes, especially the second one, where people could jump into the water from the train bridge about 80 feet above. No thanks! 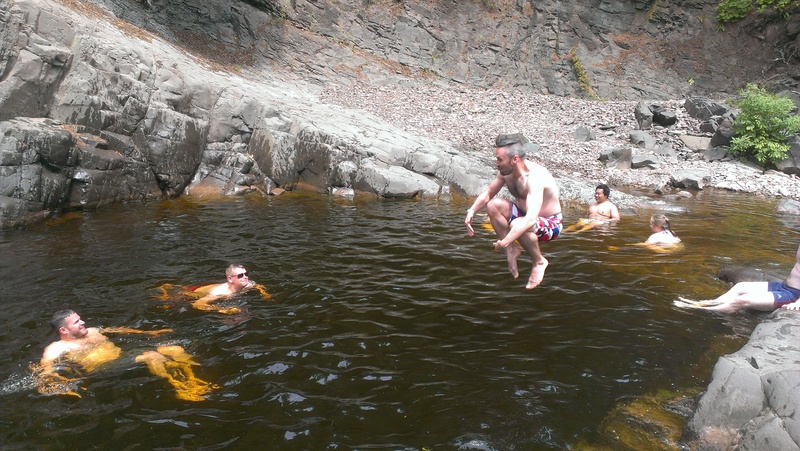 No one from our group did anything too crazy though – just a couple of regular dives and cannonballs! As is always the case with my trips, check out some pictures below! Our home for the weekend (never mind Nickles there!). 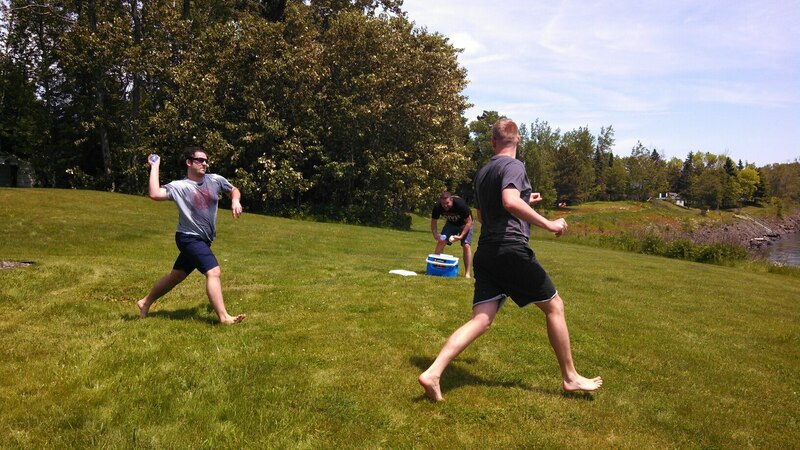 Me winding up a great water balloon throw at Scott. Don’t worry – we weren’t always trying to pelt each other with them! 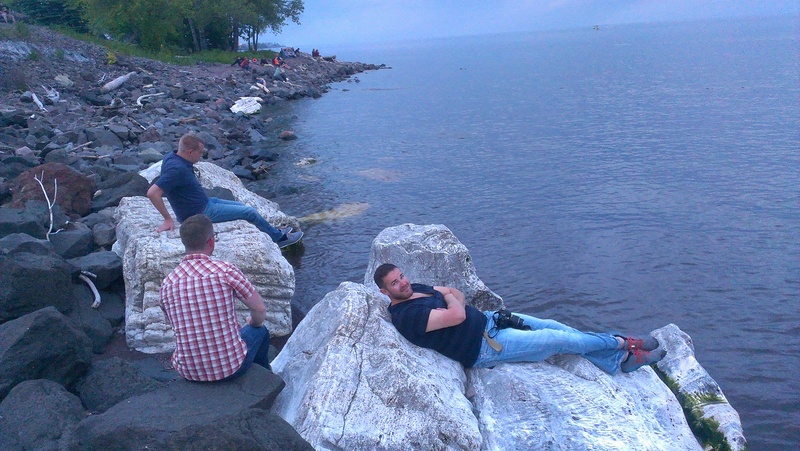 Hanging out in Duluth waiting for the fireworks to start. One of the great views near the swimming holes. This dog couldn’t get enough of the water! 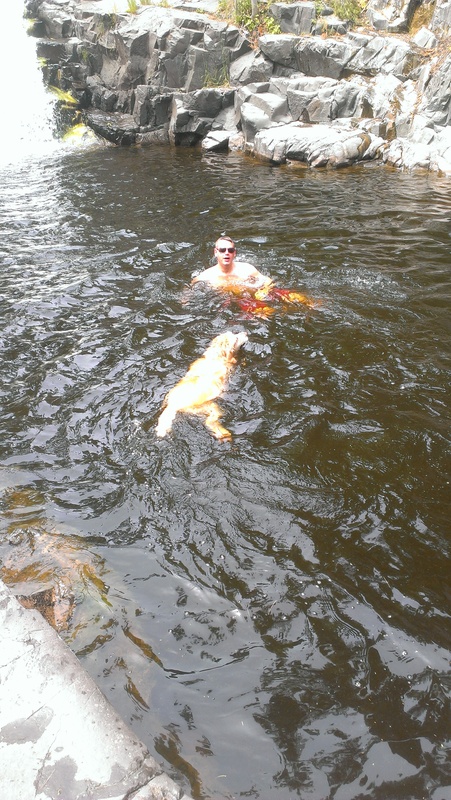 After starting to climb the hill to follow her owner home, she gave up and decided to do more swimming with us instead. 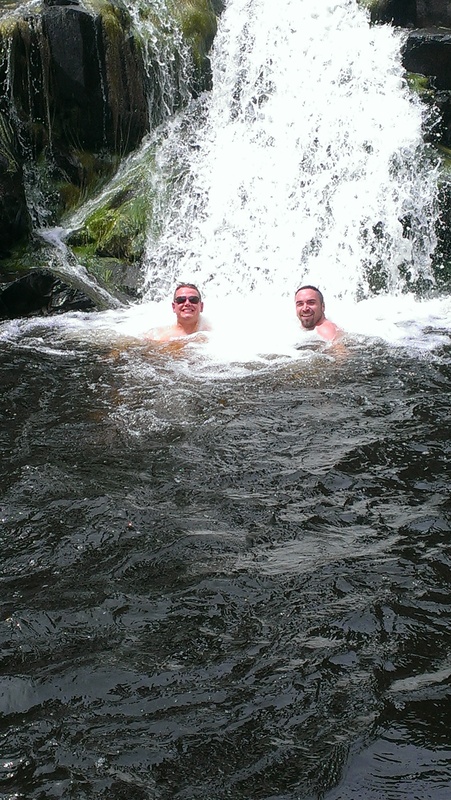 Two bathing beauties in the waterfall. He wasn’t in our group, but you can see here how crazy some of their high jumps were (and this isn’t even from the train bridge). The homeowners have a journal for guests to write notes in, so we nominated Nickles to do that. 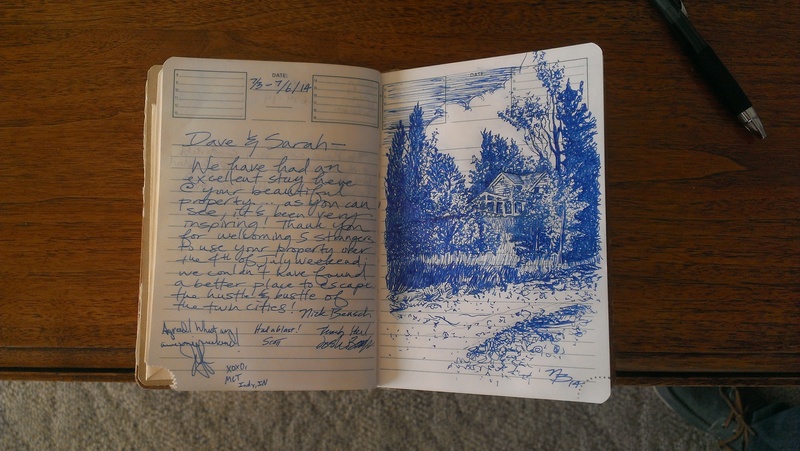 He included this amazing drawing of the house as seen from the campfire area behind the house by the lake. Looks like great fun, and such a cute house! Love the Saved by the Bell tee. 🙂 Beautiful drawing by Nickles! Thanks Jen! For some reason, I didn’t see this comment until now. It is a pretty amazing drawing though, isn’t it?? Nickles is an awesome artist! And whoa, what an amazing entry into the guest log! Way to go Nickles! Every person who comes after you will have an extra treat, courtesy of your group. Very nice.